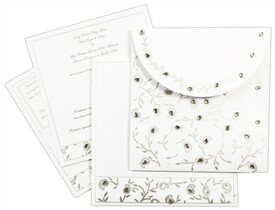 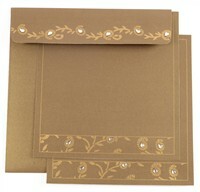 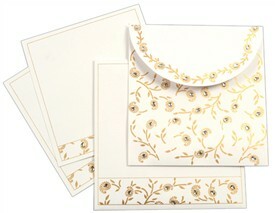 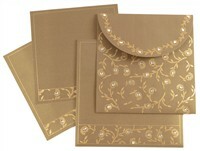 D-1077, Brown Color, Shimmery Finish Paper, Designer Multifaith Invitations, Card with Rhinestones, Anniversary Invitations. 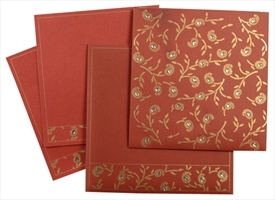 This designer kundan card has its front composed by the two folds, the upper one, with a golden printed floral border design having kundan work and the lower fold with a base design of similar floral motifs in gold having kudan work. 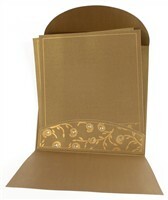 The upper fold of this designer kundan card also provides you with the space for the symbol of your choice. 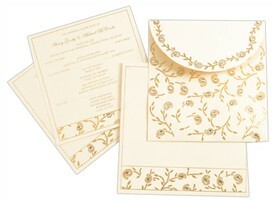 The docket has a similar base. 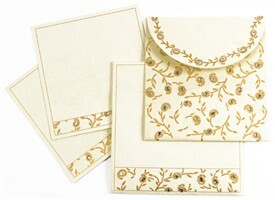 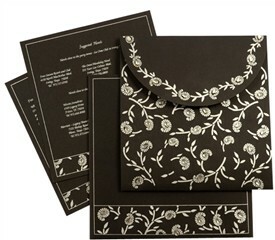 The inserts have golden line borders and the envelope has a strip border on the front and a border design on the flap having similar motifs with kundan work.